I have been agonizing over what to call this recipe. Agonizing to an embarrassing degree. I swear, sometimes I spend more time coming up with names for recipes than I do developing the recipes themselves. I feel like the name of this recipe is confusing. Is it a soup? Is it a sandwich? Well, it’s kind of both. It’s French Onion Soup with a twist. You see, in traditional French Onion Soup, you make the soup and float a piece of crusty bread topped with cheese on top of it. And it’s delicious! This recipe is a little bit different, though. The bread, onions, and cheese are in grilled panini form. The (faux) beef broth is served on the side and you dip your sandwich into it. As you eat your panini, bits of onion, cheese, and bread fall into the broth so when you’ve finished off your sandwich, you have a little bowl of French Onion bliss waiting for you. So is it a little confusing? Maybe. But it’s really good, I promise! My husband, who isn’t a huge fan of grilled cheese sandwiches, was really surprised how much these captured the flavor of French Onion Soup. 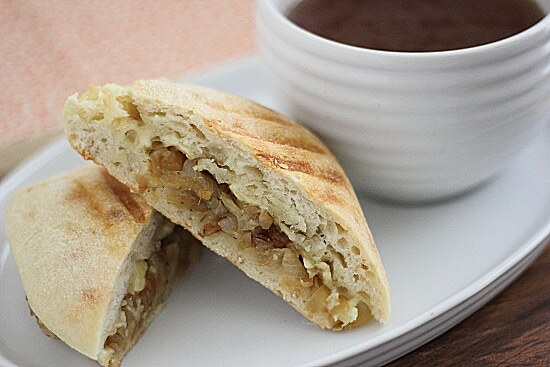 As for me, I love anything involving melted cheese and caramelized onions, so I loved these sandwiches too. In fact, we loved them so much that we ended up having them for lunch two days in a row–they’re great comfort food for a cold winter day. Is it a soup? Or is it a sandwich? It’s both! These grilled panini sandwiches are full of caramelized onions and Gruyere cheese–it’s French onion soup in sandwich form. Heat olive oil in a large skillet on low heat. Add sliced onions and cook until caramelized about an hour and fifteen minutes, stirring frequently. (For detailed instructions, see yesterday’s post on how to caramelize onions.) Remove from heat and stir in salt and pepper to taste and thyme. Heat panini press or grill on high. Divide caramelized onions onto bottom of rolls and top each one with 1/4 cup of cheese and top half of roll. Grill for 10-15 minutes or until cheese is melted and bread is golden-brown. Serve each sandwich with 1 cup of broth. I like your twist on this classic! I always thought French onion soup is one big mess to eat, trying to get the bread and cheese in your mouth, but not all at once. Your recipe seems like just the perfect solution! I love French onion soup, but I have the same problem. And then the bread gets so mushy when it’s floating in the soup for a while! YUMMY! Now, how do you make the No-Beef broth?? Thank you for pointing this out–I just added a line to the ingredients about it. 🙂 I’m sure there’s a fabulous recipe for it somewhere, but I just used the kind you buy at Whole Foods. I cheated! ARGH! I don’t have a Whole Foods. 🙁 maybe I can find it on amazon…. Better then Bouillon is a great brand and yes, you can buy it on Amazon! Their faux chicken is fabulous, too! I found 2 great recipes for French Onion Soup in The New McDougall Cookbook (pgs 132 & 133). I combined the 2 recipes and the soup turned out AMAZING! No oil and totally plant based. PS. I made my own veggie broth for it too. Yummy! I love grilled cheese and french onion soup. Will definitely try this. oh my.. my husband would LOVE these! What a clever idea! I also love the soupwich name that Mary Beth came up with! Yum! I love French Onion Soup so I will definitely try this! Let me know how it turns out if you do–this is definitely one of my husband’s favorite recipes! I need to get a panini press – this looks delish! I just use my indoor grill! I think a skillet works too–I’ve seen photos where people put the sandwich in the skillet and a plate with cans on it on top of the sandwich to weigh it down. If you’re not used to eating onions, maybe they disagreed with you a little bit. I’d focus on finding recipes made with ingredients you know you like and branch out from there. If tofu isn’t appetizing to you, there’s chickpeas and black beans! If you have a favorite recipe that’s made with chicken, try making it without! I have some resources for new vegetarians here: http://ohmyveggies.com/are-you-new-to-vegetarianism/.